As the 2017-2018 NFL Playoffs get underway and the excitement builds for the Super Bowl final, we’re looking at how this influences Google Search behaviour to identify the most popular searched teams within each of the counties in America. Using data from Google, we imported ShapeFiles directly into Azimap. On completing this process we discovered that the value of place had been removed in order to position Alaska and Hawaii next to the United States. To support this example we reapplied the spatial reference to accurately position data on the applicable county. On selecting any county you will be presented with the total search results for each team as well as the top searched team. 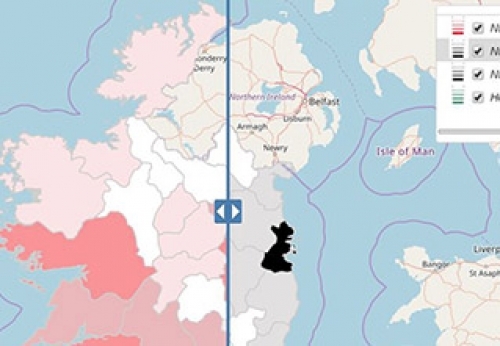 This map has been styled using the thematic styler to display each county in the top searched for team colour. This data is accurate as of Wednesday 17th January 2018. One topic that has continued to dominate the news is that is of the housing crisis within Ireland.